The world's first museum on the subject of funerals – and of course it had to be in Vienna! For the fullest exposure to Vienna's special relationship with death and funerals, this is the place to go! It's also good fun .. in that kind of morbid way! More background info: This very special Vienna museum was founded in 1967 – as the world's first such institution of its kind. It was remodelled in 1987 when curator Wittigo Keller took over (until 2013). In its original location the museum could only be visited by special appointment and only on guided tours, led by the curator himself. But this has now changed! After the old location had to be given up due to a housing development, the museum moved to new premises out by the Central Cemetery (remember, 'central' here means 'centralized' rather than in a central location). In a way that is thematically more fitting and makes for a splendid combination. But it also means it's further away from central Vienna. The new museum also substantially modernized its permanent exhibition (this was done by an outside company, and by a new curator). This is now much more "up-to-date" in design and involves more than a dozen interactive screens and such like. Furthermore it now has regular opening hours, so visits are no longer by obligatory guided tour by appointment, so now you can just go any time you like (during opening hours, of course) and do the museum at your own pace. However, I slightly lament the fact that this way you no longer get the deeply black-humoured and (darkly) illuminating narrative and comments by the curator on the live tours. I had been on them twice and thoroughly enjoyed them. So there's two sides to the changes to this museum. I suppose on balance the increased accessibility and more modern style of the new exhibition outweigh the losses. More about the Vienna funeral company: since the early 19th century and until fairly recently, the "Bestattung Wien" funeral directors' company held a monopoly in the business in the city ... until, in the wake of EU deregulation, other competitors have been allowed back on the market. But the Bestattung Wien remains by far the largest "player". 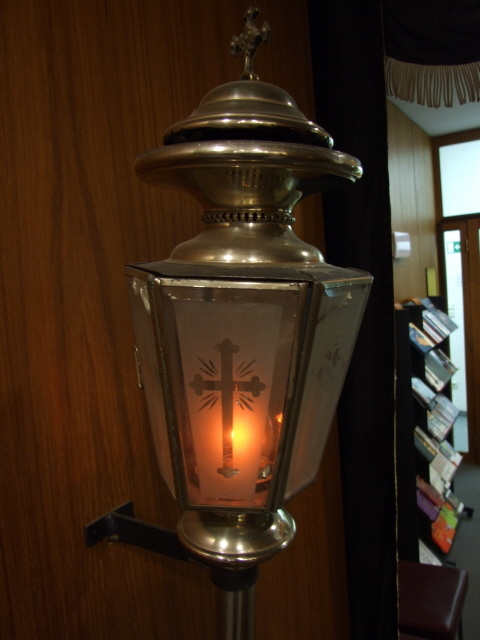 It handles some 20,000 funerals annually, mostly in Vienna, but also in the surrounding area. They have their own coffin makers, own vehicles, including traditional horse-drawn ones, and can arrange all manner of out-of-the-ordinary funerals. In fact, you even get people from abroad arranging to be buried by Bestattung Wien and in Vienna (e.g. from Germany, where restrictions on what you can and can't have as your final resting place are tougher … it's apparently been dubbed "funeral-tourism" – could this be the ultimate darkest form of "travel"?). There are now a few other museums on the same subject (see e.g. 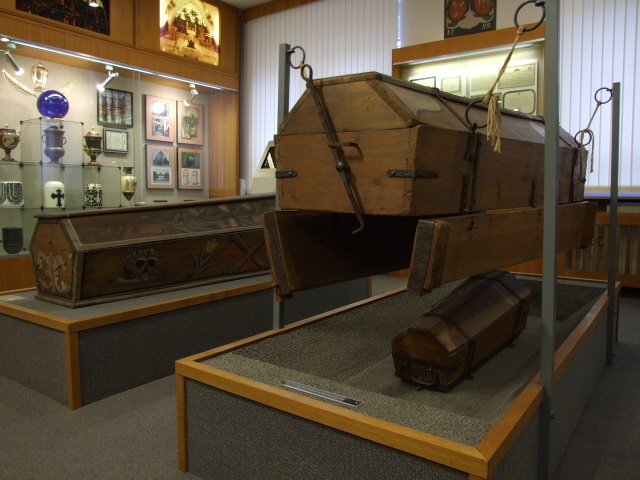 sepulchral museum in Kassel and the one in Houston, Texas). 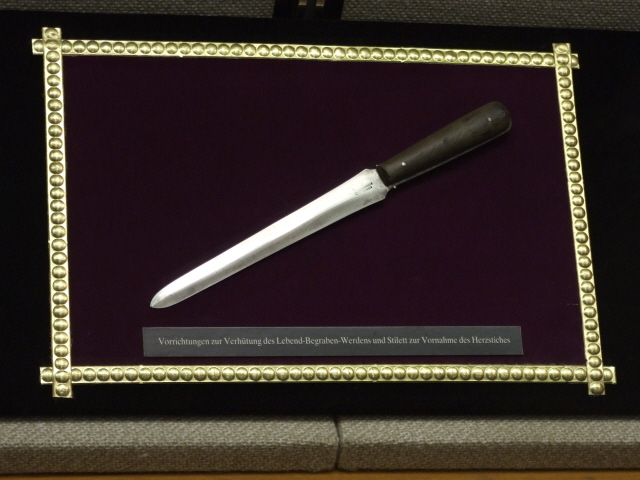 But the Vienna funeral museum gives visitors the best available impression of what it is about the Viennese and their special relationship with death. The guided tours in the old museum were also a highly entertaining experience, full of nonchalant black humour, morbid details, and some quite outrageous stories (also looking "on the light side of death", to quote from a well-known Monty Python song that famously does just that too). What there is to see: Once through the foyer and past the ticket desk, the exhibition begins behind a door to the left. Inside it is dark! Not completely dark, but certainly one of the literally darkest museum exhibitions I've ever encountered. It is of course fitting for the theme, and also makes reading what's on the little screens easier, but (available-light) photography isn't easy in here. As for the content: this is primarily focused on the historical background of the Bestattung Wien company and Vienna's special relationship with death, or rather the insistence on having a "schöne Leich", literally 'beautiful corpse', though the expression rather refers to the exuberantly pompous funeral ceremonies that were particularly popular in Vienna in the 19th and early 20th century. 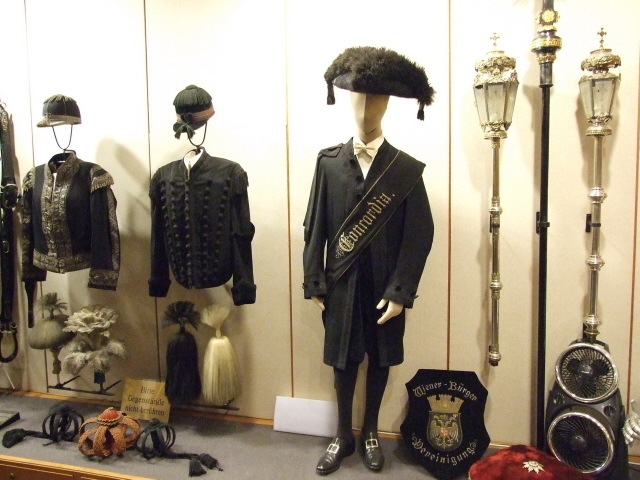 You can see lots of insignia, ceremonial uniforms, lanterns and even a full-size (original?) 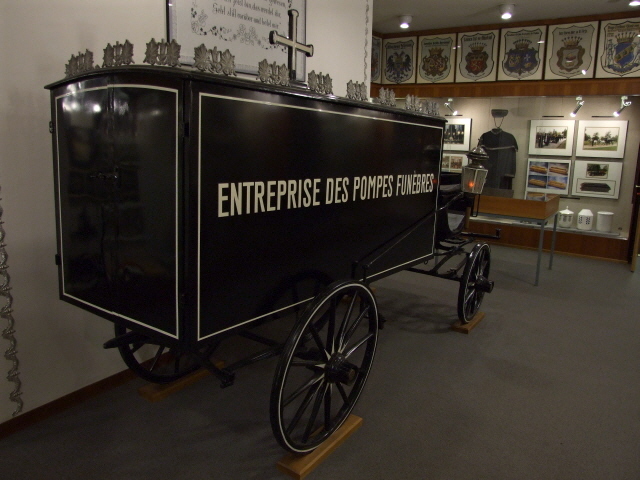 horse-drawn hearse (sans horses in here), which has the legend “Entreprise des pompes funèbres” on its side. That was the name of a funeral directors' company that was the precursor of today's Wiener Bestattungen. There is now even a coffin to be seen inside through the opened rear hatch (in the old exhibition this was closed). While that hearse is the largest exhibit in this museum, some of the smaller ones are also quite intriguing. 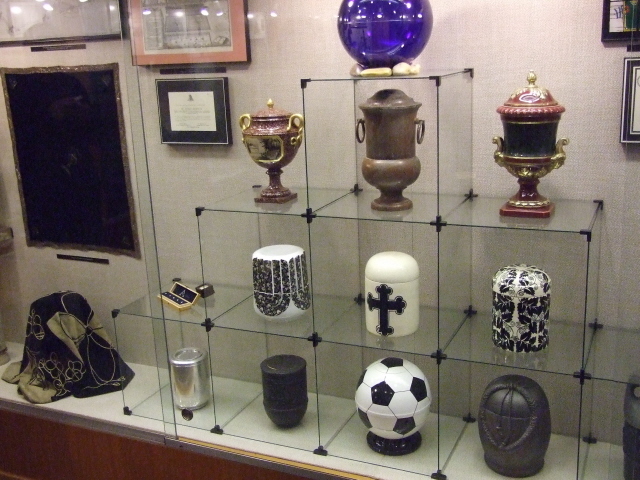 In a display cabinet with various funeral-related items there's also a small box with a tiny blue diamond. You may have guessed it already: yes, this is to represent the modern-day option of having your ashes turned into an artificial diamond under high pressure. That way widow(er)s, or other relatives of the deceased, can get the option of carrying their loved one round their neck after death. Also in glass display cases are various death masks – and even hands. Also models of hearses from other parts of the world (USA) as well as the Viennese cemetery tram that used to cart coffins from the city to the out-of town Central Cemetery (which should really have been called centralized cemetery, as it replaced all those small ones scattered around the inner city districts). 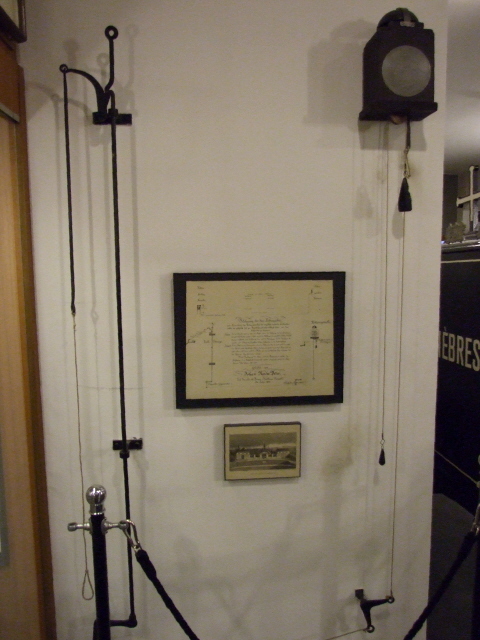 A particularly interesting exhibit is the (in)famous Viennese "rescue alarm bell" installation. In the first half of the 19th century in particular, there was a widespread fear of the possibility of being misdiagnosed dead and subsequently buried alive. The horrifying idea of waking up inside a dark coffin underground led to the invention – and heavy promotion – of this ingenious, but not quite ingenious enough contraption. The (presumably) deceased would have a finger put in a loop, attached to a string which led all the way to the cemetery warden's office. So should the not-quite-dead person inside the coffin wake up, the warden could be alerted by the ringing of this bell … prompting the warden to rush out to dig the erroneously buried person back up. So much for the theory. In practice, however, the implement only resulted in false alarms, and lots of them. And when you think about it, it's quite clear why: during different phases of decomposition, gases build up, or gravity could make carefully placed dead arms just slip – thus sounding the alarm even weeks or months after the burial. In the end, the undertakers even stopped checking, too frequent and annoying were the constant false alarms. So after an initial phase in which these offers sold like hot cakes (also attributable to clever marketing), the "craze" just petered out. I learned all this on the former guided tours at the old museum, when the curator/guide also sounded the alarm bell for us. Maybe specially arranged guided tours today still include this (update: this has tentatively been confirmed to me in the meantime; so if you go on a tour, don't forget to ask for this!). If you decide to have the heart piercing performed, after you're medically declared dead, it's an extra that costs something like 300 EUR on top of everything else, so it isn't demanded all that often any more in our (at least medically) more enlightened times. Speaking of enlightenment, the late 18th century reforms during the reign of Emperor Joseph II have to be mentioned here too – it was him who decreed that funerals be made more hygienic and, as we would say today, environmentally friendly: a) by banning all funerals within the city (e.g. in the catacombs under St Stephen's Cathedral, instead banishing them to newly established cemeteries outside the city, such as the St. Marx Cemetery); and b) by using a "recyclable" coffin. In Vienna's funeral museum, however, you can still admire the contraption. Part of the guided tours in the old museum was a demonstration of how it worked (albeit sans corpse falling out at the bottom). Now it just hangs there, and a bit too low for you to immediately spot the hatch bottom. (As with the alarm bell mentioned above, I've been informed that the hatch mechanism is still occasionally demonstrated albeit only on guided tours). Another item I could not spot any longer was a particularly gruesome piece in the memento mori section: a ca. 12-inch scale model of a coffin with a corpse being eaten by (somewhat oversized) grubs, lovingly made with great attention to detail. It was probably deemed too shocking to make it into the new exhibition. The museum also sells a very quirky selection of souvenirs. Amongst more predictable items such as postcards and books/brochures on the topic, they also have coffin-shaped USB-sticks, ashtrays and, my favourite: cigarette pack cases that bear the legend: "Rauchen sichert Arbeitsplätze", literally, 'smoking secures jobs', together with the Bestattung Wien logo! Cunning as this may be, however, the introduction of this item did nothing to deter people from smoking. In fact it appears to have been a massive sales success … no big surprise in Austria, really, where chain-smoking is still the norm and morbid cynicism a way of life. Location: inside the Central Cemetery on the south-eastern edge of Vienna, just behind Gate 2, to the right, in the basement of the Aufbahrungshalle 2 (chapel of rest) – the sign “museum” should be noticeable enough. Address: Simmeringer Hauptstr. 234, 1110 Vienna. Note: the museum is no longer at Goldeggasse in the 4th district, as several sources (both online and in print) still say. Access and costs: slightly restricted; not too expensive for what it is. Details: In the past this splendidly dark museum could only be visited on a guided tour. This has changed since 2014. At its new location, the museum now has regular opening times: weekdays only, from 9 a.m. to 4:30 p.m. (closed weekends and holidays). To get there from the city centre you can take either tram line 71 (from Schwarzenberplatz) or line 6 (from Stadthalle, Central Station or Belvedere). You can cut the travelling time somewhat by first getting the U3 metro to Simmering and getting on the tram there (from where it is only four stops). Admission: 6 EUR (concession 5 EUR, under-19-year-olds free). An audio guide can be hired for an extra 6 EUR (and you have to produce a photo ID). Time required: between 30 minutes and an hour. Combinations with other dark destinations: The new location of the funeral museum right within Vienna's Central Cemetery (Zentralfriedhof) naturally makes this by far the most obvious combination. You basically can't do one without the other (just make sure not to go on a weekend when the museum is closed!). Geographically not too far from the museum is the cemetery of the nameless, another rather unique Viennese site. To get there first take tram line 6 to the terminus at Kaiserebersdorf and from there bus line 76A. Other cemeteries in the city well worth visiting include the enchanting St Marx Cemetery. To get there head back on tram line 71 to St Marx from where it is a ca. 10 minute walk. If you head back all the way to the terminus of tram line 71 at Schwarzenbergplatz, you can take in an unusual gem of a monument, on the southern end of the large square: the Soviet war memorial, complete with a statue of a soldier with a golden shield in front of a fountain and flanked by colonnades with inscriptions in Cyrillic. The other, far end of Schwarzenbergplatz takes you to the ring road around the Inner City old core of Vienna, which also holds more dark sites: e.g. the catacombs of St Stephen's Cathedral, the Imperial Crypt or the Michaelergruft would all make very suitable supplements to a visit to the funeral museum. Combinations with non-dark destinations: The Central Cemetery also doubles up as a nature reserve and is a very pleasant park to stroll around in. For Vienna's proper mainstream tourist attractions, however, you first have to head back to the centre, back by tram line 71, which takes you straight to Schwarzenbergplatz on the edge of the central First District. From the southern end of Schwarzenbergplatz the baroque Belvedere Palace is just a few steps away. Its upper palace, by the way, played an important part in Austria's post-war history, as it was here that the Austrian State Treaty was signed and the newly independent Republic was declared in 1955. These days it serves as an art gallery, mainly of the works of Gustav Klimt et al., representing the Viennese Jugendstil (art nouveau).